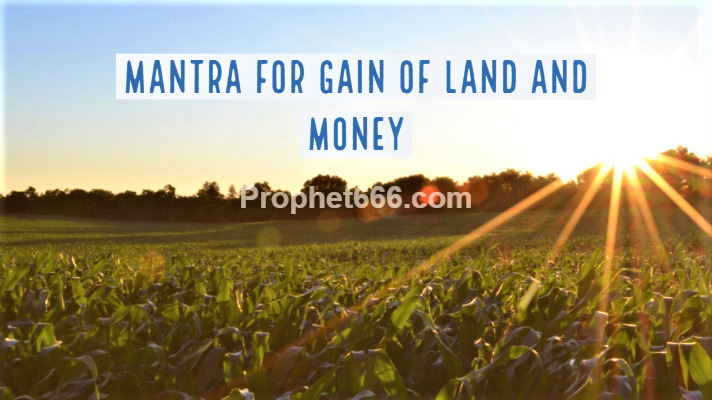 In this post, I have written about a special Mantra for becoming the owner of land and becoming rich and prosperous. This Mantra is called as the Prithvi Dayak or Bhumi Dene Vala Mantra meaning the Mantra, which blesses the chanter of the Mantra with Land. The type of land, which is gained by the practitioner can be agricultural land, land for making a house or land for any other purpose. This will primarily depend upon the inner most desire of the practitioner. The Mantra Sadhana can be started on any auspicious day, like a Shubh Muhurat, Shubh Tithi or any Hindu Festival. The procedure of practicing this Mantra Sadhana has been given below. 1] The Mantra, which is given below has to be first Siddh or Mastered by chanting it 300, 000 times in as short a period of time as possible by chanting it for a fixed and specified number of Mantra Chants per day. The practitioner can use a Rudraksha Japa Mala for counting the prescribed number of Mantra Chants. 2] Then, after the conclusion of the Mantra Chanting, the practitioner should perform Dashansh Havan, which is 1/10th of the specified number of Mantra Chants that 30, 000 times. The Havan can be performed with the three different kinds of offerings that have been described below. A] A Havan performed by offering Ghee and Naivedya is said to make the practitioner the owner of land. B] A Havan performed by offering fresh fruits is said to bless the practitioner with a large amount of money and wealth [Lakshmi Prapti] along with land. C] A Havan performed with offering of Trimadhur, meaning Ghee, Shahad and Mishri or Clarified Butter, Honey and Rock Sugar is said to be the best kind of Havan as it will increase the quantity of both the land and the wealth that will be gained by the practitioner. Note- See the sections of Wealth Mantras and Lakshmi Mantras and Prayers for more Mantras for the gain of money and wealth.